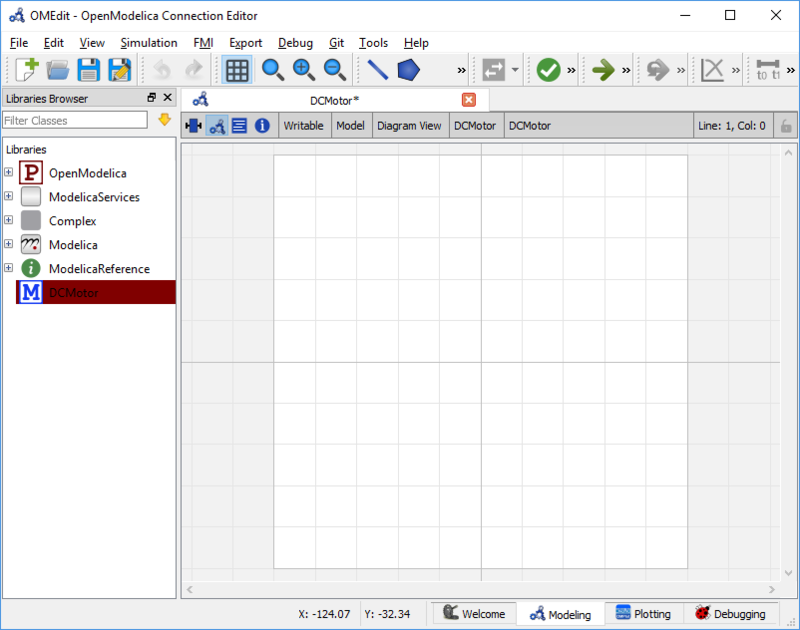 OMEdit – OpenModelica Connection Editor is the new Graphical User Interface for graphical model editing in OpenModelica. 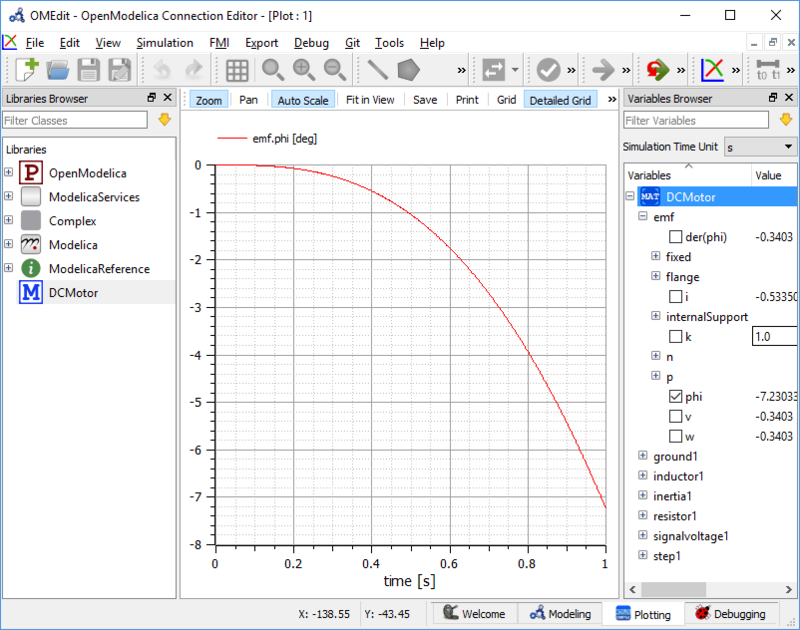 It is implemented in C++ using the Qt graphical user interface library and supports the Modelica Standard Library that is included in the latest OpenModelica installation. 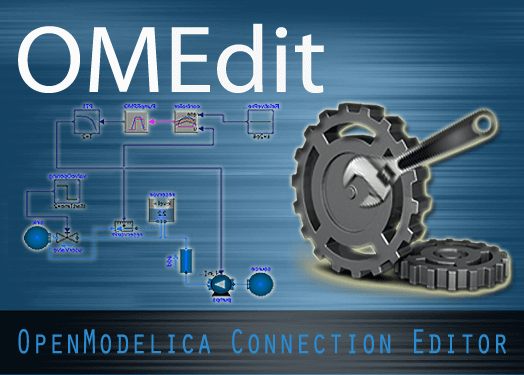 This chapter gives a brief introduction to OMEdit and also demonstrates how to create a DCMotor model using the editor. Modeling – Easy model creation for Modelica models. immediate usage and later reuse. editing connections between model interfaces. simulation parameters start and stop time, etc. Plotting – Interface to plot variables from simulated models. A splash screen similar to the one shown in Figure 5 will appear indicating that it is starting OMEdit. The executable is found in different places depending on the platform (see below). Figure 5 OMEdit Splash Screen. OMEdit can be launched using the executable placed in OpenModelicaInstallationDirectory/bin/OMEdit/OMEdit.exe. 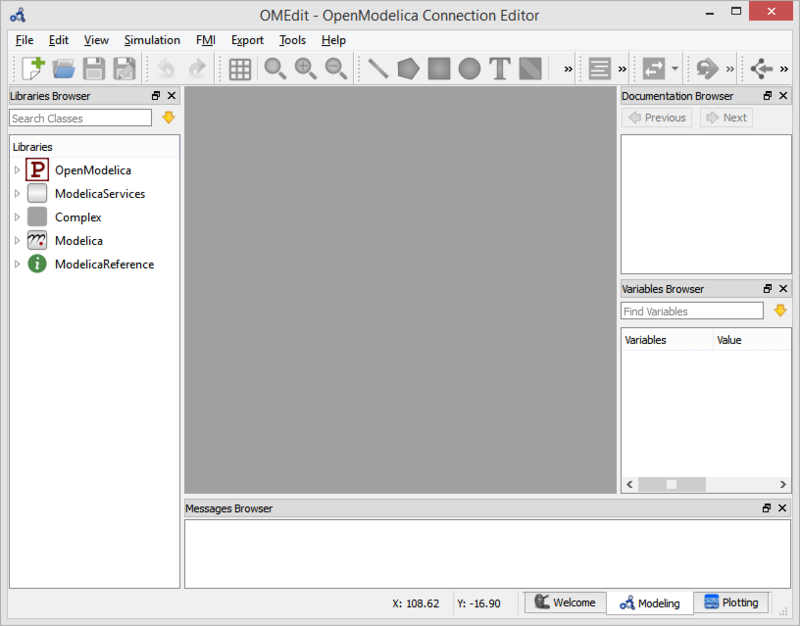 Alternately, choose OpenModelica > OpenModelica Connection Editor from the start menu in Windows. Start OMEdit by either selecting the corresponding menu application item or typing “OMEdit” at the shell or command prompt. The default installation is /Application/MacPorts/OMEdit.app. Figure 6 shows the MainWindow and browsers. Figure 6 OMEdit MainWindow and Browsers. The default location of the browsers are shown in Figure 6. All browsers except for Message Browser can be docked into left or right column. The Messages Browser can be docked into top or bottom areas. If you want OMEdit to remember the new docked position of the browsers then you must enable Preserve User's GUI Customizations option, see section General. To filter a class click Edit > Filter Classes or press keyboard shortcut Ctrl+Shift+F. The loaded Modelica classes can be filtered by typing any part of the class name. To view the Libraries Browser click View > Windows > Libraries Browser. Shows the list of loaded Modelica classes. Each item of the Libraries Browser has right click menu for easy manipulation and usage of the class. The classes are shown in a tree structure with name and icon. The protected classes are not shown by default. If you want to see the protected classes then you must enable the Show Protected Classes option, see section General. 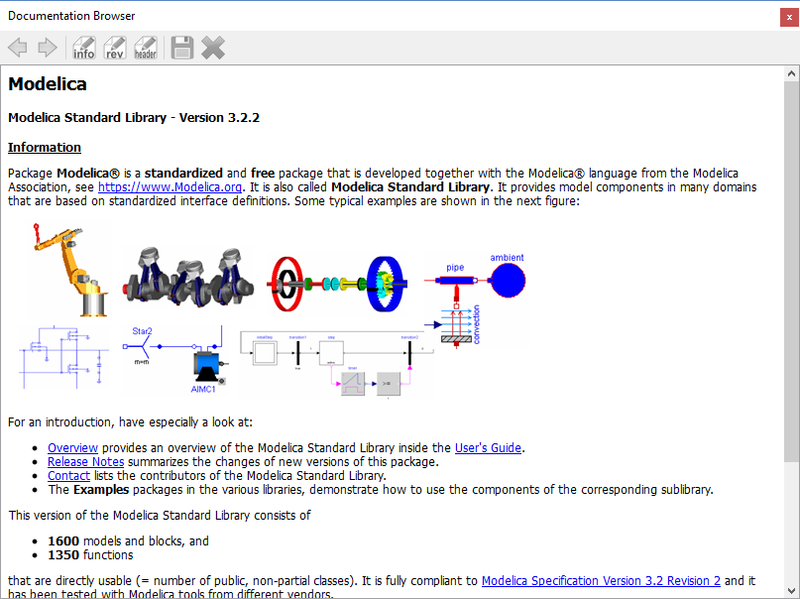 Displays the HTML documentation of Modelica classes. It contains the navigation buttons for moving forward and backward. It also contains a WYSIWYG editor which allows writing class documentation in HTML format. To see documentation of any class, right click the Modelica class in Libraries Browser and choose View Documentation. The class variables are structured in the form of the tree and are displayed in the Variables Browser. Each variable has a checkbox. Ticking the checkbox will plot the variable values. There is a find box on the top for filtering the variable in the tree. The filtering can be done using Regular Expression, Wildcard and Fixed String. The complete Variables Browser can be collapsed and expanded using the Collapse All and Expand All buttons. The browser allows manipulation of changeable parameters for Re-simulating a Model. It also displays the unit and description of the variable. See section Messages for Messages Browser options. Figure 10 OMEdit Welcome Perspective. The Welcome Perspective shows the list of recent files and the list of latest news from https://www.openmodelica.org/. See Figure 10. The orientation of recent files and latest news can be horizontal or vertical. User is allowed to show/hide the latest news. See section General. The Modeling Perpective provides the interface where user can create and design their models. See Figure 11. Figure 11 OMEdit Modeling Perspective. The Modeling Perspective interface can be viewed in two different modes, the tabbed view and subwindow view, see section General. The Plotting Perspective shows the simulation results of the models. Plotting Perspective will automatically become active when the simulation of the model is finished successfully. It will also become active when user opens any of the OpenModelica’s supported result file. Similar to Modeling Perspective this perspective can also be viewed in two different modes, the tabbed view and subwindow view, see section General. Figure 12 OMEdit Plotting Perspective. 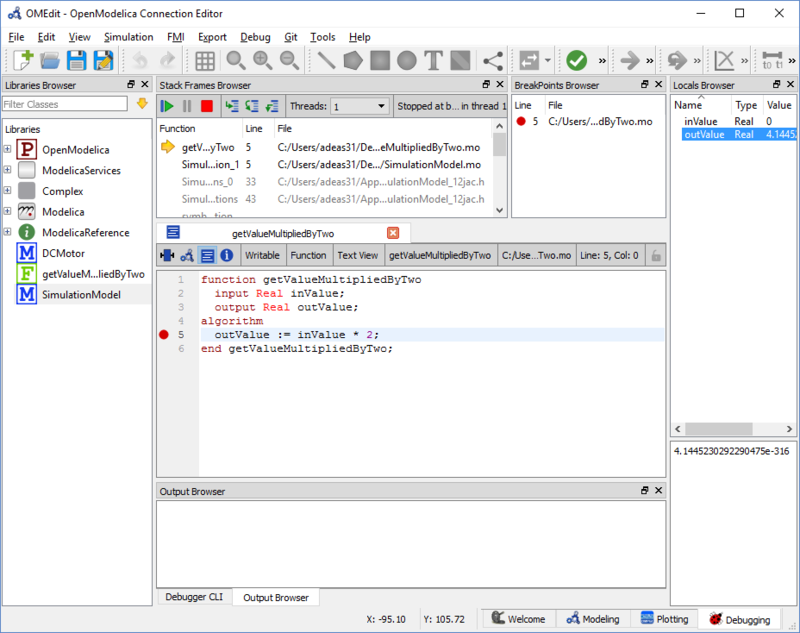 The application automatically switches to Debugging Perpective when user simulates the class with algorithmic debugger. The prespective shows the list of stack frames, breakpoints and variables. Figure 13 OMEdit Debugging Perspective. 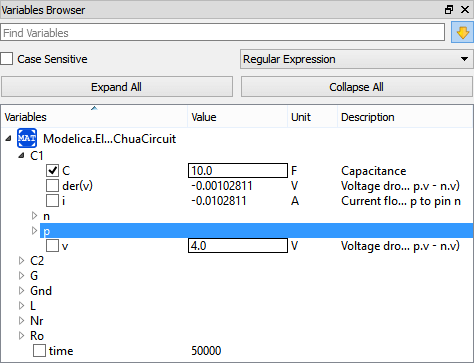 Select File > New Modelica Class from the menu. Click on New Modelica Class toolbar button. Click on the Create New Modelica Class button available at the left bottom of Welcome Perspective. Select File > Open Model/Library File(s) from the menu. Click on Open Model/Library File(s) toolbar button. Click on the Open Model/Library File(s) button available at the right bottom of Welcome Perspective. Select File > Open/Convert Modelica File(s) With Encoding from the menu. It is also possible to convert files to UTF-8. For each Modelica class one Model Widget is created. It has a statusbar and a view area. The statusbar contains buttons for navigation between the views and labels for information. The view area is used to display the icon, diagram and text layers of Modelica class. See Figure 14. Figure 14 Model Widget showing the Diagram View. Drag the models from the Libraries Browser and drop them on either Diagram or Icon View of Model Widget. In order to connect one component model to another the user first needs to enable the connect mode ( ) from the toolbar. Move the mouse over the connector. The mouse cursor will change from arrow cursor to cross cursor. To start the connection press left button and move while keeping the button pressed. Now release the left button. Move towards the end connector and click when cursor changes to cross cursor. Right clicking the model from the Libraries Browser and choosing Simulation Setup. Start Time – the simulation start time. Stop Time – the simulation stop time. Number of Intervals – the simulation number of intervals. Method – the simulation solver. See section Integration Methods for solver details. Tolerance – the simulation tolerance. Jacobian - the jacobain method to use. Root Finding - Activates the internal root finding procedure of dassl. Restart After Event - Activates the restart of dassl after an event is performed. Compiler Flags (Optional) – the optional C compiler flags. Number of Processors – the number of processors used to build the simulation. Build Only – only builds the class. Launch Transformational Debugger – launches the transformational debugger. Launch Algorithmic Debugger – launches the algorithmic debugger. Launch Animation – launches the 3d animation window. Output Format – the simulation result file output format. File Name Prefix (Optional) – the name is used as a prefix for the output files. Result File (Optional) - the simulation result file name. Protected Variables – adds the protected variables in result file. Store Variables at Events – adds the variables at time events. Show Generated File – displays the generated files in a dialog box. Model Setup File (Optional) – specifies a new setup XML file to the generated simulation code. Initialization Method (Optional) – specifies the initialization method. Equation System Initialization File (Optional) – specifies an external file for the initialization of the model. Equation System Initialization Time (Optional) – specifies a time for the initialization of the model. Clock (Optional) – the type of clock to use. Linear Solver (Optional) – specifies the linear solver method. Non Linear Solver (Optional) – specifies the nonlinear solver. Linearization Time (Optional) – specifies a time where the linearization of the model should be performed. Output Variables (Optional) – outputs the variables a, b and c at the end of the simulation to the standard output. Profiling – creates a profiling HTML file. CPU Time – dumps the cpu-time into the result file. Enable All Warnings – outputs all warnings. LOG_DASSL - additional information about dassl solver. LOG_DASSL_STATES - outputs the states at every dassl call. LOG_DEBUG - additional debug information. LOG_DSS - outputs information about dynamic state selection. LOG_DSS_JAC - outputs jacobian of the dynamic state selection. LOG_DT - additional information about dynamic tearing. LOG_EVENTS - additional information during event iteration. LOG_EVENTS_V - verbose logging of event system. LOG_INIT - additional information during initialization. LOG_IPOPT - information from Ipopt. LOG_IPOPT_FULL - more information from Ipopt. LOG_IPOPT_JAC - check jacobian matrix with Ipopt. LOG_IPOPT_HESSE - check hessian matrix with Ipopt. LOG_IPOPT_ERROR - print max error in the optimization. LOG_JAC - outputs the jacobian matrix used by dassl. LOG_LS - logging for linear systems. LOG_LS_V - verbose logging of linear systems. LOG_NLS - logging for nonlinear systems. LOG_NLS_V - verbose logging of nonlinear systems. LOG_NLS_HOMOTOPY - logging of homotopy solver for nonlinear systems. LOG_NLS_JAC - outputs the jacobian of nonlinear systems. LOG_NLS_JAC_TEST - tests the analytical jacobian of nonlinear systems. LOG_NLS_RES - outputs every evaluation of the residual function. LOG_NLS_EXTRAPOLATE - outputs debug information about extrapolate process. LOG_RES_INIT - outputs residuals of the initialization. LOG_RT - additional information regarding real-time processes. LOG_SIMULATION - additional information about simulation process. LOG_SOLVER - additional information about solver process. LOG_SOLVER_CONTEXT - context information during the solver process. LOG_SOTI - final solution of the initialization. LOG_STATS - additional statistics about timer/events/solver. LOG_STATS_V - additional statistics for LOG_STATS. LOG_ZEROCROSSINGS - additional information about the zerocrossings. Additional Simulation Flags (Optional) – specify any other simulation flag. Shows the list of simulations already finished or running. Double clicking on any of them opens the simulation output window. Successful simulation of model produces the result file which contains the instance variables that are candidate for plotting. Variables Browser will show the list of such instance variables. Each variable has a checkbox, checking it will plot the variable. See Figure 12. The plotting type depends on the active Plot Window. By default the plotting type is Time Plot. Plots the variable over the simulation time. You can have multiple Time Plot windows by clicking on New Plot Window toolbar button ( ). Draws a two-dimensional parametric diagram, between variables x and y, with y as a function of x. You can have multiple Plot Parametric windows by clicking on the New Plot Parametric toolbar button ( ). The Variables Browser allows manipulation of changeable parameters for re-simulation. After changing the parameter values user can click on the re-simulate toolbar button ( ), or right click the model in Variables Browser and choose re-simulate from the menu. Since OpenModelica 1.11 , OMEdit has built-in 3D visualization, which replaces third-party libraries (such as Modelica3D) for 3D visualization. 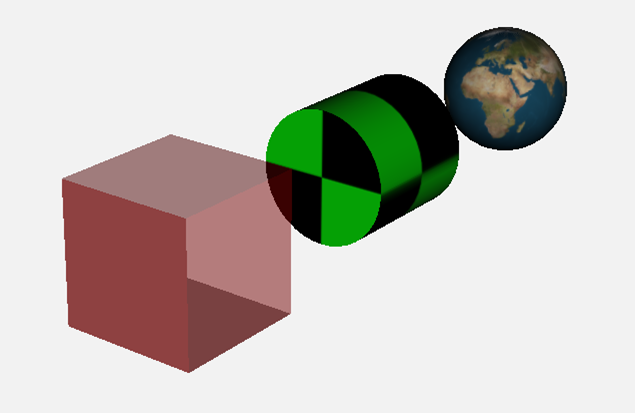 The 3d visualization is based on OpenSceneGraph. In order to run the visualization simply right click the class in Libraries Browser an choose “Simulate with Animation” as shown in Figure 15. Figure 15 OMEdit Simulate with Animation. One can also run the visualization via Simulation > Simulate with Animation from the menu. When simulating a model in animation mode, the flag +d=visxml is set. Hence, the compiler will generate a scene description file _visual.xml which stores all information on the multibody shapes. 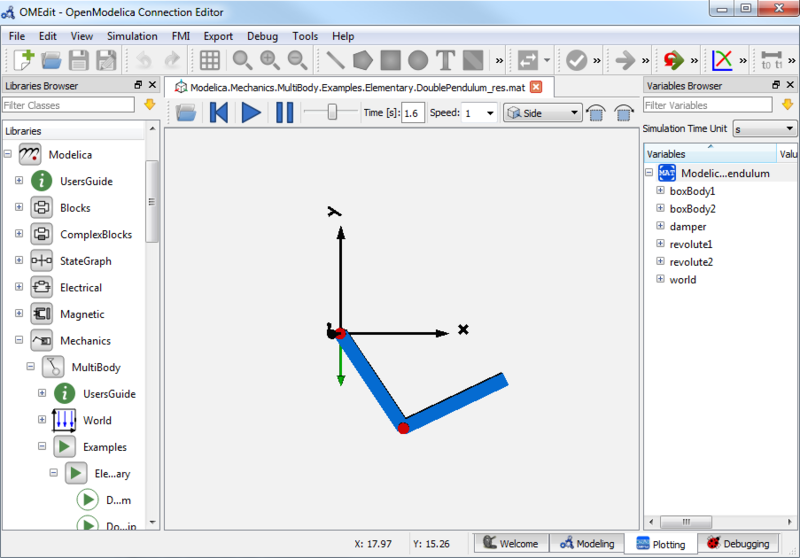 This scene description references all variables which are needed for the animation of the multibody system. When simulating with +d=visxml, the compiler will always generate results for these variables. After the successful simulation of the model, the visualization window will show up automatically as shown in Figure 16. Figure 16 OMEdit 3D Visualization. The animation starts with pushing the play button. The animation is played until stopTime or until the pause button is pushed. By pushing the previous button, the animation jumps to the initial point of time. Points of time can be selected by moving the time slider or by inserting a simulation time in the Time-box. The speed factor of animation in relation to realtime can be set in the Speed-dialog. Other animations can be openend by using the open file button and selecting a result file with a corresping scene description file. Predefined views (Isometric, Side, Front, Top) can be selected and the scene can be tilted by 90° either clock or anticlockwise with the rotation buttons. Change Transparency The shape becomes either transparent or intransparent. Make Shape Invisible The shape becomes invisible. Change Color A color dialog pops up and the color of the shape can be set. Apply Check Texture A checked texture is applied to the shape. Apply Custom Texture A file selection dialog pops up and an image file can be selected as a texture. Remove Texture Removes the current texture of the shape. Users can create shapes of their own by using the shape creation tools available in OMEdit. points. In order to create a line, the user first selects the line tool from the toolbar and then click on the Icon/Diagram View; this will start creating a line. If a user clicks again on the Icon/Diagram View a new line point is created. In order to finish the line creation, user has to double click on the Icon/Diagram View. fashion as a line is created. The only difference between a line and a polygon is that, if a polygon contains two points it will look like a line and if a polygon contains more than two points it will become a closed polygon shape. points where first point indicates the starting point and the second point indicates the ending the point. In order to create rectangle, the user has to select the rectangle tool from the toolbar and then click on the Icon/Diagram View, this click will become the first point of rectangle. In order to finish the rectangle creation, the user has to click again on the Icon/Diagram View where he/she wants to finish the rectangle. The second click will become the second point of rectangle. similar way as a rectangle is created. Text Tool – Draws a text label. Bitmap Tool – Draws a bitmap container. 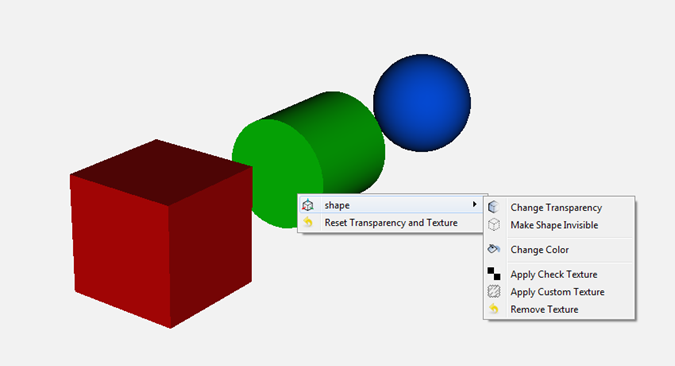 The shape tools are located in the toolbar. See Figure 19. Figure 19 User defined shapes. The user can select any of the shape tools and start drawing on the Icon/Diagram View. The shapes created on the Diagram View of Model Widget are part of the diagram and the shapes created on the Icon View will become the icon representation of the model. In the above code snippet of testModel, the rectangle and a polygon are added to the icon annotation of the model. Similarly, any user defined shape drawn on a Diagram View of the model will be added to the diagram annotation of the model. OMEdit allows users to save several settings which will be remembered across different sessions of OMEdit. The Options Dialog can be used for reading and writing the settings. Language – Sets the application language. Working Directory – Sets the application working directory. All files are generated in this directory. Toolbar Icon Size – Sets the size for toolbar icons. Preserve User’s GUI Customizations – If true then OMEdit will remember its windows and toolbars positions and sizes. Terminal Command – Sets the terminal command. When user clicks on Tools > Open Terminal then this command is executed. Terminal Command Arguments – Sets the terminal command arguments. Hide Variables Browser – Hides the variable browser when switching away from plotting perspective. Library Icon Size – Sets the size for library icons. Show Protected Classes – If enabled then Libraries Browser will also list the protected classes. Tabbed View/SubWindow View – Sets the view mode for modeling. Icon View/DiagramView/Modelica Text View/Documentation View – If no preferredView annotation is defined then this setting is used to show the respective view when user double clicks on the class in the Libraries Browser. Auto Save interval – Sets the auto save interval value. The minimum possible interval value is 60 seconds. Enable Auto Save for single classes – Enables the auto save for one class saved in one file. Enable Auto Save for one file packages – Enables the auto save for packages saved in one file. Horizontal View/Vertical View – Sets the view mode for welcome page. Show Latest News – if true then displays the latest news. System Libraries – The list of system libraries that should be loaded every time OMEdit starts. Force loading of Modelica Standard Library – If true then Modelica and ModelicaReference will always load even if user has removed them from the list of system libraries. 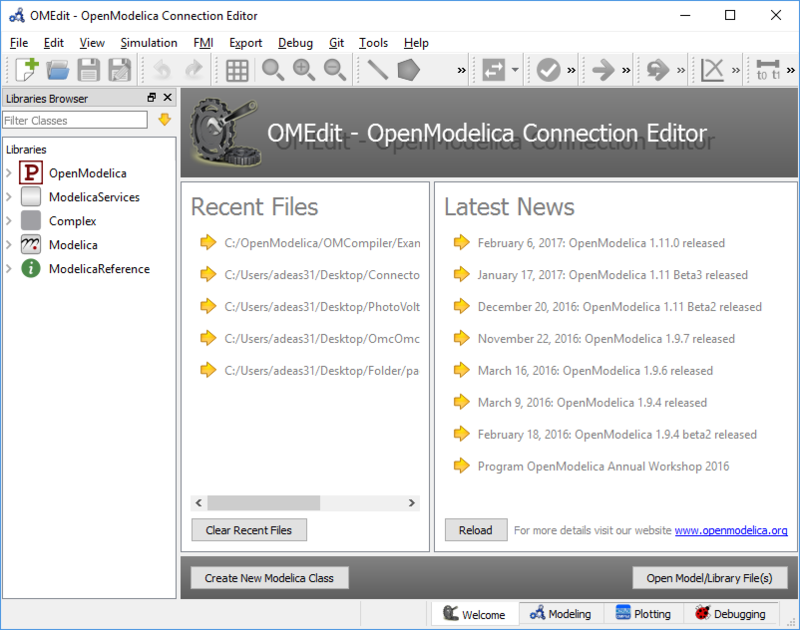 Load OpenModelica library on startup – If true then OpenModelica package will be loaded when OMEdit is started. User Libraries – The list of user libraries/files that should be loaded every time OMEdit starts. Line Ending - Sets the file line ending. Byte Order Mark (BOM) - Sets the file BOM. Tab Policy – Sets the tab policy to either spaces or tabs only. Tab Size – Sets the tab size. Indent Size – Sets the indent size. Enable Syntax Highlighting – Enable/Disable the syntax highlighting. Enable Code Folding - Enable/Disable the code folding. When code folding is enabled multi-line annotations are collapsed into a compact icon (a rectangle containing "...)"). A marker containing a "+" sign becomes available at the left-side of the involved line, allowing the code to be expanded/re-collapsed at will. Match Parentheses within Comments and Quotes – Enable/Disable the matching of parentheses within comments and quotes. Enable Line Wrapping – Enable/Disable the line wrapping. Font Family – Shows the names list of available fonts. Sets the font for the editor. Font Size – Sets the font size for the editor. Preserve Text Indentation – If true then uses diffModelicaFileListings API call otherwise uses the OMC pretty-printing. Items – List of categories used of syntax highlighting the code. Item Color – Sets the color for the selected item. Preview – Shows the demo of the syntax highlighting. Left – Defines the left extent point for the view. Bottom – Defines the bottom extent point for the view. Right – Defines the right extent point for the view. Top – Defines the top extent point for the view. Horizontal – Defines the horizontal size of the view grid. Vertical – Defines the vertical size of the view grid. Matching Algorithm – sets the matching algorithm for simulation. Index Reduction Method – sets the index reduction method for simulation. Target Language – sets the target language in which the code is generated. Target Compiler – sets the target compiler for compiling the generated code. OMC Flags – sets the omc flags for simulation. Ignore __OpenModelica_commandLineOptions annotation – if ture then ignores the __OpenModelica_commandLineOptions annotation while running the simulation. 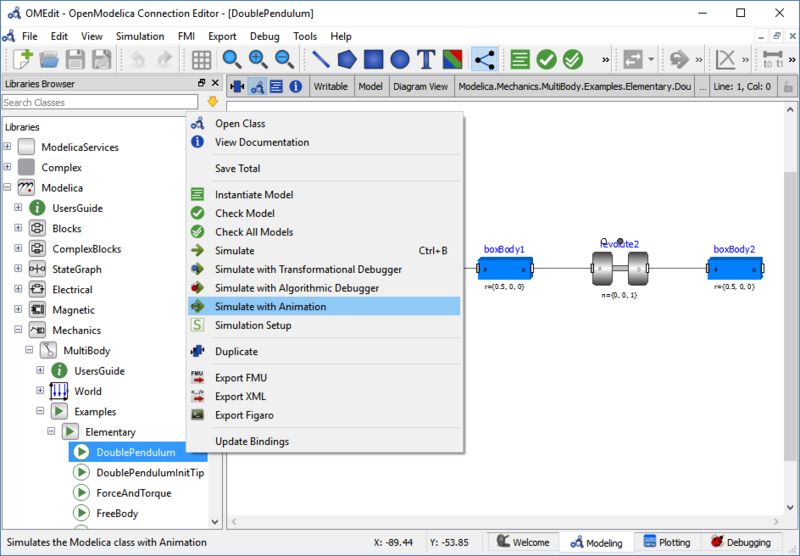 Ignore __OpenModelica_simulationFlags annotation – if ture then ignores the __OpenModelica_simulationFlags annotation while running the simulation. Save class before simulation – if ture then always saves the class before running the simulation. Switch to plotting perspective after simulation – if ture then GUI always switches to plotting perspective after the simulation. Structured – Shows the simulation output in the form of tree structure. Formatted Text – Shows the simulation output in the form of formatted text. Output Size - Specifies the maximum number of rows the Messages Browser may have. If there are more rows then the rows are removed from the beginning. Reset messages number before simulation – Resets the messages counter before starting the simulation. Font Family – Sets the font for the messages. Font Size – Sets the font size for the messages. Notification Color – Sets the text color for notification messages. Warning Color – Sets the text color for warning messages. Error Color – Sets the text color for error messages. Always quit without prompt – If true then OMEdit will quit without prompting the user. Show item dropped on itself message – If true then a message will pop-up when a class is dragged and dropped on itself. Show model is defined as partial and component will be added as replaceable message – If true then a message will pop-up when a partial class is added to another class. Show component is declared as inner message – If true then a message will pop-up when an inner component is added to another class. Show save model for bitmap insertion message – If true then a message will pop-up when user tries to insert a bitmap from a local directory to an unsaved class. Always ask for the dragged component name – If true then a message will pop-up when user drag & drop the component on the graphical view. Color – Sets the line color. Pattern – Sets the line pattern. Thickness – Sets the line thickness. Start Arrow – Sets the line start arrow. End Arrow – Sets the line end arrow. Arrow Size – Sets the start and end arrow size. Smooth – If true then the line is drawn as a Bezier curve. Color – Sets the fill color. Pattern – Sets the fill pattern. Auto Scale – sets whether to auto scale the plots or not. Tabbed View/SubWindow View – Sets the view mode for plotting. Pattern – Sets the curve pattern. Thickness – Sets the curve thickness. Figaro Library – the Figaro library file path. Tree generation options – the Figaro tree generation options file path. Figaro Processor – the Figaro processor location. GDB Command Timeout – timeout for gdb commands. GDB Output Limit – limits the GDB output to N characters. Display C frames – if true then shows the C stack frames. Display unknown frames – if true then shows the unknown stack frames. Unknown stack frames means frames whose file path is unknown. Clear old output on a new run – if true then clears the output window on new run. Clear old log on new run – if true then clears the log window on new run. Always show Transformational Debugger after compilation – if true then always open the Transformational Debugger window after model compilation. Generate operations in the info xml – if true then adds the operations information in the info xml file. Model Exchange – Sets the FMI export type to Model Exchange. Co-Simulation – Sets the FMI export type to Co-Simulation. Model Exchange and Co-Simulation – Sets the FMI export type to Model Exchange and Co-Simulation. FMU Name – Sets a prefix for generated FMU file. Platforms - list of platforms to generate FMU binaries. TLM Plugin Path - path to TLM plugin bin directory. TLM Manager Process - path to TLM managar process. TLM Monitor Process - path to TLM monitor process. For debugging capability, see Debugging. Go to Tools > Options > Libraries. Remove Modelica & ModelicaReference from list of system libraries. Uncheck force loading of Modelica Standard Library. Add $OPENMODELICAHOME/lib/omlibrary/Modelica X.X/package.mo under user libraries. 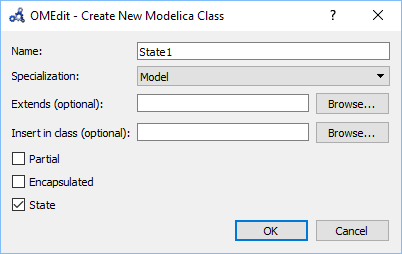 Follow the same steps as defined in Creating a New Modelica Class. Additionally make sure you check the State checkbox. Figure 20 Creating a new Modelica state. In order to make a transition from one state to another the user first needs to enable the transition mode ( ) from the toolbar. Move the mouse over the state. The mouse cursor will change from arrow cursor to cross cursor. To start the transition press left button and move while keeping the button pressed. Now release the left button. Move towards the end state and click when cursor changes to cross cursor. A Create Transition dialog box will appear which allows you to set the transition attributes. Cancelling the dialog will cancel the transition. Double click the transition or right click and choose Edit Transition to modify the transition attributes.